Preheat the oven to 400°. Cut a slit in the side of each chicken breast without slicing all the way through, then open up like a book. Gently pound out the chicken 1/8 inch thick. Season both sides with salt, pepper and the rosemary. Top each breast with 1/4 pound sausage, form into a log and roll up the breast around the sausage. In an ovenproof skillet, heat the EVOO, 2 turns of the pan, over medium-high heat. Place the chicken in the pan seam side down and cook, turning, until browned all over, 5 minutes. Transfer the skillet to the oven and bake until cooked through, 25 minutes. Meanwhile, in a medium saucepan, bring the chicken broth, cranberries and orange peel to a boil over medium-high heat. Lower the heat and simmer for 5 minutes. Stir in the milk and return to a boil. Whisk in the polenta and cook, whisking, until thickened, about 5 minutes. Turn off the heat and whisk in the cheese and 2 tablespoons butter; season with salt and pepper. Transfer the chicken to a plate. Place the skillet over medium heat and stir in the marsala, scraping up any browned bits from the bottom of the pan. Add the orange slices. Add the remaining 2 tablespoons butter and swirl the pan to combine. To serve, slice the chicken on an angle and fan out on dinner plates. Spoon the marsala sauce and orange slices on top. Serve with the polenta. In Recipes-list.com we have selected the most viewed recipes from category - uncategorized . Enjoy the best recipes specially selected for you! 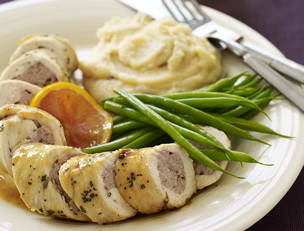 Sausage-Stuffed Chicken Breasts with Marsala and Cranberry-Orange Polenta is the right choice that will satisfy all your claims.